Wakes up the body for class. This energizing breathing exercise can fill your lungs with up to six times more oxygen than a regular breath. Since oxygen is a major source of energy for the body, it is not usual to feel dizzy in the standing deep breathing. Through compression of the throat, the velocity of air entering the lungs is increased to shoot air into the lower lobes of the lungs. While your arms lift to the ceiling the ribcage opens, maximizing the inhale. Because this breath is up to six times deeper than a regular breath, it increases lung capacity while giving you quick energy. The exhale breath detoxifies the lungs deeply. When stagnant air is pushed from the bottom of the lungs it causes a release of cellular and metabolic waste from the respiratory system. As the eyes look back to see the back wall, the ocular nerve is stimulated. With the head tilted back, the upper spine opens helping to prepare the neck for backward bending. Overall, the body is energized and the circulatory and nervous systems are stimulated, invigorating the body for class. Improves and strengthens every muscle in the central part of the body, especially the back and abdomen. As you maintain both sides of half-moon the sides of the spine are stretched. By maintaining the form of the pose and keeping your hips and shoulders in alignment, your body receives many benefits. First the body burns fat from the thighs, waist and buttocks while the muscles of the central body are strengthened. The organs receive a massage which helps with proper digestive function. Finally the deep stretching stimulates glands and organs to help give you quick energy while maintaining the health of many body systems. Those concerned and intimidated by back-bending should rest assured that the controlled environment and proper progression of the Bikram Yoga series allows for back-bends to be preformed safely. Unlike traditional “touch-your-toes” hamstring-stretch taught in PE class, hands-to-feet pose the whole body. This is perfect example of how a pose can both work to strengthen and stretch your body. 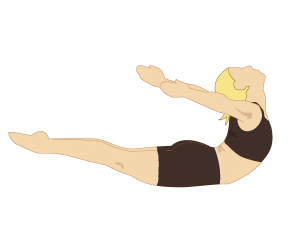 As you pull with your arms to increase flexibility, your spine, hips and legs are stretched in what Bikram calls a “360 degree stretching angle.” Completion of this pose after half-moon and backward-bending, means that the spine has been stretched in four directions, the circulatory and nervous systems have been invigorated to prepare the body for class. Helps to realign the legs to prevent lower-back pain. Tones the arms, getting rid fat deposits from under the arms. Helps to align the meniscus in the knee. Reduces flat feet, bunions and bowed legs. Good for arthritic conditions in knees and hips. Helps to release anger and frustration. This strength posture depends on the precise alignment of the feet to deliver the benefits. While in posture, the legs and feet are realigned helping to decrease back-pain. Essentially, the pose works almost like an orthotic. The muscles of the upper body are also profoundly strengthened by the back-bending and positioning of the arms helping with toning. 12 major joints of the body: shoulders, elbows, wrists, hips, knees and ankles. Improves and maintains joint lubrication. Improves the mobility of the hip joint. Improves immune system through stimulation of the lymphatic system. Good for urinary tract infections in women. Good for prostate health in men. Eagle pose opens the major joints through stretching during the pose. As the arms and legs twist,pressure is created that irrigates the circulatory system. Blood is reserved in the muscles of the thighs, calves, arms and fore-arms. When the arms and legs release this blood flow flushes the joints helping to relieve joint problems and maintaining synovial fluid. 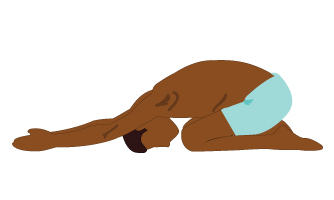 The deep compression of this posture also massages organs and glands. Eagle pose particularity stimulates the reproductive system making this a great pose for sexual vitality and fertility. 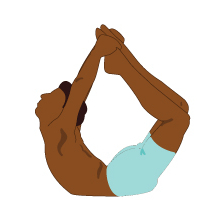 Standing bow-pulling pose is incredibly effective at flushing the circulatory system. The pose moves blood flow from one side of the body, dumping it into the other and creating a profound circulatory flush. Standing bow is a hugely expressive pose, helping to open the shoulders, hips, spine releasing emotion and stress from the tissues. As in standing head to knee, the position of the chest increases pressure on the heart helping to stimulate and exercise the cardiovascular system. Stimulates the heart and arteries, strengthening the heart. Helps to clear blockages from arteries helping to prevent future cardiovascular problems. Helps varicose veins. Burns fat (up to 300 calories during the posture according to Rajishree Choudhury.) Slims waistline and eliminates deposits fat on the body. Relieves tension from the spine. Balancing stick is the best posture for your heart. Proper execution of the pose means that the arms and legs are positioned above the heart (except the standing leg.) This helps to flush the heart and arteries, particularity the horse-shoe artery. This makes the posture therapeutic for heart-conditions and effective for preventing heart disease and heart attack. Finally, because of the amount of muscles mass used in execution of the pose, balancing stick is one of the biggest calorie burners in the Bikram Yoga series. Helps to increase flexibility of the spine. Helps to relieve depression and memory loss. Good for digestion, hyperacidity, constipation. After the intense cardio workout of the balancing postures, this pose helps to calm the nervous system, release the lower back and flush the brain. The purpose of standing separate leg stretching is to create a 360 degree stretching in the body. It is easy to focus on stretching of the legs in this pose, but it is important to work the arms and bring the stretch into the spine. 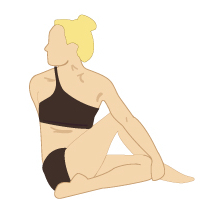 Triangle is the most comprehensive posture in the Bikram Yoga series. This post helps to work all of the major organs, muscles and systems of the body. Triangle involves an extreme amount of concentration. The pose cannot be executed without constant attention to form and continuos adjustment to the position of your body. Maintaining triangle pose helps to bring a harmony to the respiratory and cardiovascular systems. Boosts the metabolism and immune system. Good for depression and memory loss. Is good for rheumatism and lower back pain. The focus in standing separate forehead-to-knee is to create maximum compression in the front side of the body. This pose is often called the six pack posture because of the way that it strengthens the abs when done correctly. The endocrine system benefits the most from this posture getting a thorough compression that helps to boost the metabolism and immune system. It is important to always remember that the posture is about touching the forehead to the knee to get the benefits of the posture, and not about stretching the hamstrings. 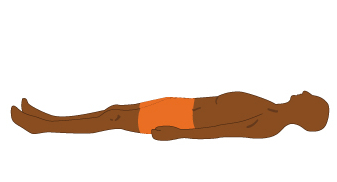 After the body has been stimulated by preforming the standing series, a two minute savasana is preformed to heal the body. 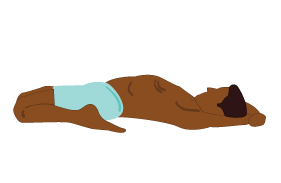 Savasana is one of the most important parts of a hatha-yoga practice and it is often said that this is where the “magic” happens in the Bikram Yoga series. That magic is the healing that is created by the stillness of the pose. When the body is still the circulatory system is unobstructed and delivers oxygen, nutrients and white blood-cells to where it is needed. These materials are the building blocks of healing, which creates the therapeutic benefit of this pose. Regulates and normalizes hydrochloric acid levels in stomach. Improves and may cure conditions of constipation, flatulence and hyperacidity. Increases peristalsis in the gut. 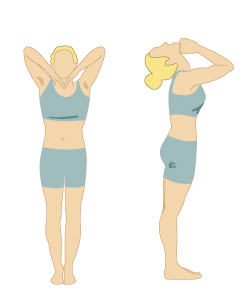 Wind-removing pose is like Bikram’s “Pepto Bismol.” This pose stimulates the ascending, descending and transverse colon as well as the stomach and small intestines. 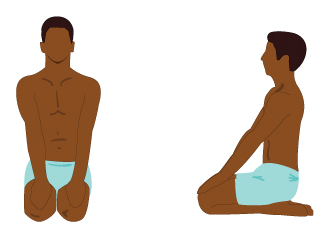 The order in which the pose is preformed helps to stimulate the bowels, cures constipation and improves nutrient absorption. The posture is called “wind-removing” for a reason, as it helps to relieve flatulence. Finally it helps to balance out hydrochloric acid levels in the stomach helping with indigestion and heartburn. eliminate toxins from the lungs. The sit-up serves to invigorate the body in between poses. A quick stretch to the hamstrings, it helps to prepare and open the lower back and legs for the final stretching pose at the end of class. More importantly the double-exhale helps to release toxins from the lungs helping to energize the body in between the poses. Improves the function of the large and small intestines, liver, kidney and spleen. Improves pigeon chest by opening the rib cage. Permits maximum expansion of the lungs increasing oxygen intake, therapeutic for asthma. Improves function of reproductive organs. Strengthens the immune system and revitalizes the thyroid. Looking up tones the optic nerve, improving vision. Helps to regulate blood pressure through compression of the kidneys and renal system. 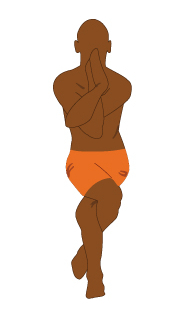 Cobra pose triggers the lower back, helping with various spinal conditions. Cobra creates an intense massage of the abdomen which helps digestive function and prevents and helps to cure digestive ailments. The pelvic floor is activated in this posture helping with menstrual problems, fertility and the function of reproductive organs. Effective in helping conditions of slipped disc and sciatica. Helps with tennis elbow, carpal tunnel syndrome and arthritis in the wrists and hands. 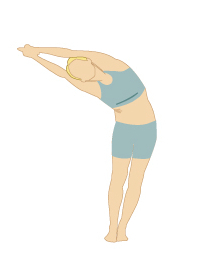 Locust pose helps to re-align the elbow, a joint that is naturally built to straighten but rarely does. As you lie down on top the elbow, compression blocks blood flow to the wrists and elbows in the pose. When the legs lift, the upper back is engaged to strengthen the muscles of the back and shoulders. When the pose is released pressurized blood flow flushes the elbows and wrists getting rid of calcium deposits, arthritic starts and scar tissue. Locust is also beneficial for carpal tunnel syndrome and tennis elbow and effectively maintains the dexterity of your hands. Helps with poor posture, relieves and prevents lower-back pain. Helps relieve lumbago, arthritis, rheumatism, cervical spondylosis. Helps regulate and prevent menstrual problems. Helps with loss of appetite and fatigue. Releases and breaks through fear, concern and overwhelming responsibility. 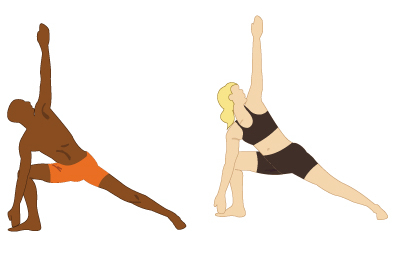 Full locust is one of the most difficult postures to improve in the Bikram Yoga series. The posture triggers and strengthens the mid-spine helping to prevent lower back pain. It is also effective at strengthening and toning the hips and buttocks. Improves breathing by extending and opening the diaphragm and chest. Good for anorexia and bulimia. 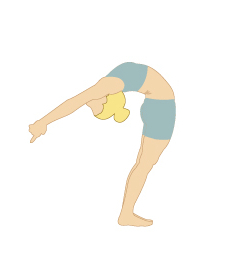 After the strengthening benefits of cobra, locust and full locust, bow pose opens the entire spine in a deep back bend. Highly therapeutic for the spine, this pose is also beneficial for the digestive system and reproductive systems which get massaged during the posture. Improves circulation to kidneys, liver, pancreas and bowels. Helps to boost the immune system through stimulation of the spleen. Helps to stimulate the lymphatic system, particularly the lymph glands of the arm-pit. Helps with digestion problems including indigestion, gas, constipation. Good for asthma and respiratory conditions. Helps to flush knees and ankles of calcium deposits, scar tissue and arthritic starts. Helps to minimize menstrual pain. Helps with sciatica, gout and varicose veins. Helps to activate kundalini energy. Maintains sexual longevity with age. Fixed-firm is the knee healer in the Bikram series. This posture evenly stretches all of the major ligaments in the knees and ankles in an anatomically correct position. This means it rebuilds the natural flexibility of the knees and ankles. While in the posture, compression of the circulatory system decreases blood flow to these joints and then flushes them to eliminate scar-tissue, arthritic starts and calcium deposits in the joints. It is also massages the lymph system which is highly beneficial for the immune system. A rejuvenation pose providing maximum relaxation. Relieves digestion problems and constipation. Improves mobility of shoulder girdle. Helps to increase circulation to facial muscles, helping to prevent and erase the signs of aging. Half tortoise increases circulation to the brain stimulating the pineal and pituitary gland helping to regulate serotonin and melatonin. This helps to balance sleep cycles and prevent and cure depression. It is often said that this posture is equivalent to eight of hours of sleep. This is because in the pose, so much oxygen and nutrients are carried to the brain that the only way to get the same benefit is to sleep for eight hours. Tones and stretches muscles and nerves attached to the spine. Helps with spondylitis of cervical, thoracic and lumbar spine. Improves flexion of neck and spine. Helps with genito-urinary disorders of the kidneys, urinary bladder, ovaries, testes and prostate. Helps gastro-intestinal disorders: constipation, colitis, dyspepsia, liver and gall bladder problems. 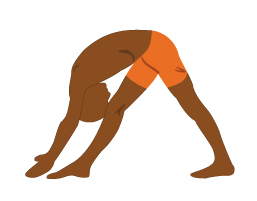 Camel pose is the deepest back-bend in the Bikram series. Camel is a hugely emotional posture that releases much stress and anxiety from the chest. It invigorates the nervous system and helps to heal many different spinal ailments. Helps relieve glandular problems . Rabbit pose is the prefect balance to camel pose. The postures work together to deeply stretch and open the spine. Rabbit helps to open the inter-vertebral disks, helping to maintain their spongy nature and absorb shock in spine from daily movement. It helps to stretch the spine so effectively that with a regular practice many people report growing up to one inch. The stretch in rabbit is created by the pull on the heels, so it is important to always keep a tight grip in order to create enough force to stretch the spine. Increases circulation to liver, spleen and pancreas. Stimulates and tones the digestive organs, increases peristalsis, relieves constipation and other digestive problems. Mobilizes joints and increases elasticity in the lumbar spine. Improves concentration and mental endurance. Reverses flow of kundalni energy, distributing it through the spine, improving creativity. Forehead-to-knee once again compresses the front side of the body deeply massaging the pancreas, helping to regulate blood sugar. The posture is like doing a seated standing head-to-knee and is a good opportunity to practice perfecting the form without worrying about balance. The kidneys are also extended in this posture helping with the function of the renal system. The final forward stretch helps to extend the legs and stretch the spine in a 360 degree angle. It is a pose that is incredibly effective for releasing tension from the hamstrings and the lower back. After compressing, decompressing, twisting and bending the spine in four directions, the final spine twist is the last detoxification for the vertebral column. A good massage for the abdominal organs, the primary focus is to twist and, like a wet rag, release all the toxins from the spine. Normalizes digestion and bowel movements. Kapalbhati breathing is the most effective yogic breathing exercise for detoxifying the lower lungs, where many toxins accumulate. It also works the abdominal muscles like a sit up exercise. Finally it helps to calm the nervous system and cool down the body’s core temperature to help prepare for cooler temperatures outside the hot room.